क्या भारत ने अफ्रीका में रोड बना दिया ? 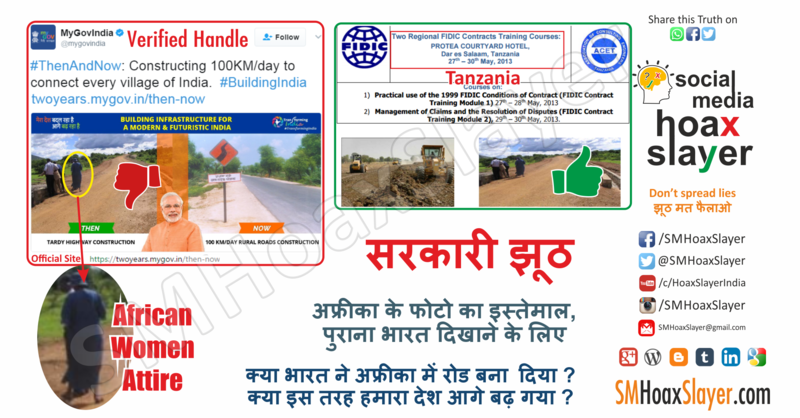 क्या इस तरह हमारा देश आगे बढ़ गया ? Even a #Government #Website doesn’t check Facts or is this intentional? This is a Photo posted in 2013 from Africa. Even the dress of the lady tells all. Government is accountable and should not use wrong photos. ← No such notification from @RBI . You cannot deposit old 500, 1000 notes in any bank on 29, 30, 31 March. December 6, 2018 Hoax Slayer Comments Off on Were Pakistan’s flags used on Kolkata’s roads ? May 24, 2018 Hoax Slayer Comments Off on This doesn’t work for SIM Swap fraud. It’s not Anna Hazare with Modi Ji.